Slow Down, Look Around, and Be Inspired! Gardening is a passion of mine. If you know me at all…or follow me on Instagram…you know I can go on and on about different varieties of eggplant, squash bugs, canning or anything related to playing in my raised beds. My garden is my oasis, my classroom, and my centering point. It’s my spiritual sanctuary and often a huge source of inspiration. When you think about designing or decorating a room, it’s easy to fall into the same old habits: grab ideas from a design magazine; check out HOUZZ or Pinterest; run a Google search. And all these can yield instant results, but there’s so much more all around you! Nature, in general, is a wonderful source of inspiration, both for your home’s interior and your soul’s interior. Growing things — whether it’s flowers or vegetables or house plants — is an incredibly grounding opportunity. There’s so much to learn in the correlation between growing plants and life. You can’t rush things. Each stage of life is meaningful in its own way. There’s beauty in slow…in wait…in silence. We have, in general, become such a society of instant gratification that we have lost the art of slow. And, I think, we all crave that inner peace that comes from pause and consideration. We can miss the spark of creativity just by being so busy we snuff the flame out. I can find a world of color in my garden–but I have to slow down, be intentional, and look beyond my pre-conceptions. Tomatoes are red. Carrots are orange. Yes, those things are true. But there’s more, if you take a closer look. It’s blackberry season and my garden is exploding with these shiny black berries! 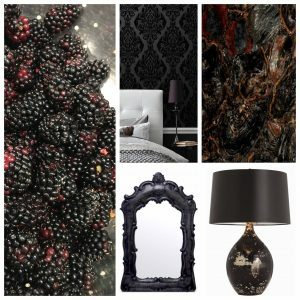 Black is mysterious and sensual, yet when combined with cool metallics and red tones, it’s exciting and rich. Sweet and sour, basic yet exotic…this onyx-colored fruit is a juicy color inspiration! 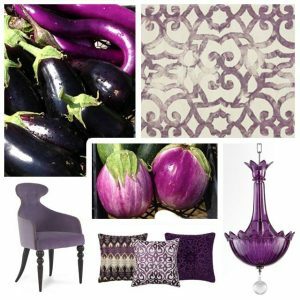 Eggplant is the one vegetable that I typically over-plant. I can’t help it! The varieties are gorgeous — from the long lavender Asian varieties, to the violet & white globe-shaped Italian heirlooms, to the almost-black market standards. Reddish purple has long been regarded as a color fit for royalty, and these beautiful plants and fruits certainly are the kings and queens of my garden. Tomatoes start as a lovely green before they are red, and when they get to red, they don’t all stop on the same shade. 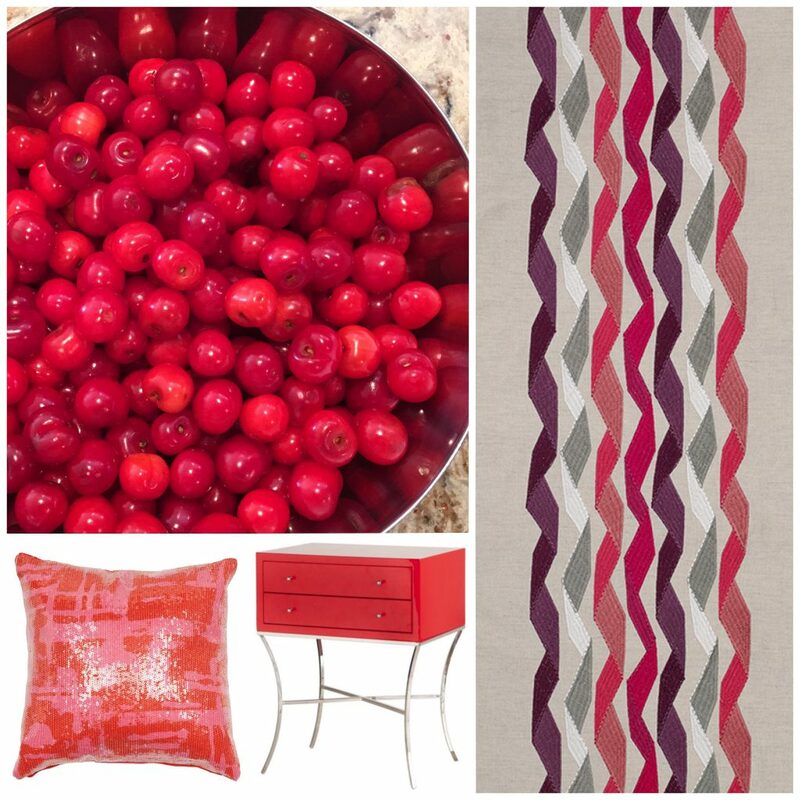 Cherries are red, but ours were almost a translucent red that borders on fuchsia and shiny as acrylic or colored glass. The color itself produces a visual texture. Carrots are orange, yes. However, the seed catalog lures me with exotic varies of red, yellow, white, and purple! 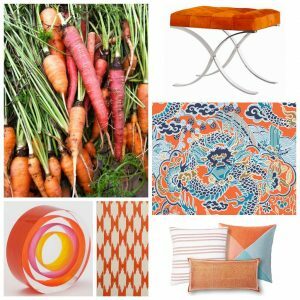 I love how orange mingles well with the crisp green and the blues of the sky on a gorgeous garden day. Orange is fresh, zingy, and invigorating. By the way, those green carrot tops can inspire you, too — and they have a beautiful fragrance if you stop long enough to smell them. (Stop and smell the roses is so cliché, but you can do that, too, after you’ve smelled the carrot tops!) Plus, half of the beauty of my garden comes before any fruit appears! 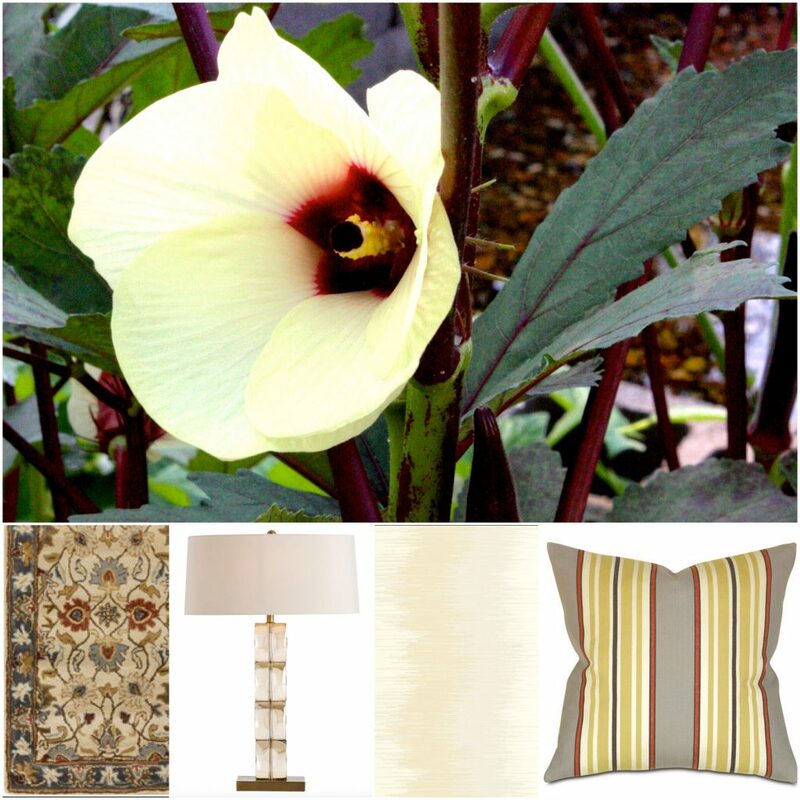 Red okra blossoms are stunners; crepe-like barely-there yellow framed with purple-red stems and blue-green foliage. So much inspiration to come from these gorgeous veggies in the making! Besides gardening, kayaking is a favorite activity. My favorite spot is right along the rocky cliffs at the edge of the water. I look at the rocks and the trees — but it’s only when I slow down that I can see down into deep into the water, down into the submerged wonderland. It’s a different and wonderful perspective when I stop rushing. 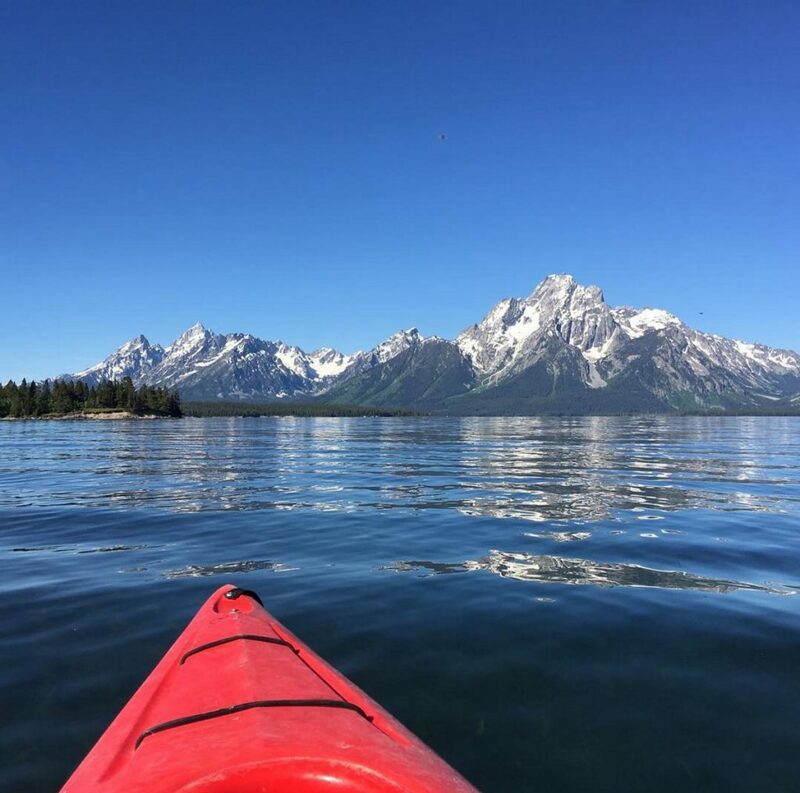 Whether it’s on Table Rock Lake or in the Grand Tetons, I love to kayak. It forces me to slow down, and we could all use more of that. This summer, I encourage you to slow down and take a look around. Look at the trees, for example. As a child, my art teacher asked our class to draw a tree. All of us grabbed a brown crayon for the bark and a green one for the leaves. Then she had us really look at pictures of different trees. The bark was grey and charcoal and very little brown. The leaves were green–but many different shades of green, with yellow and blue and silver also appearing on the undersides of the leaves. We had to adjust how we looked at our surroundings. It’s a lesson I’ve never forgotten. It’s a spiritual experience to be in nature, whether it’s your garden, or a park, or a stream. Our innermost being needs to be centered with the organic, but it takes work and a plan to make it happen. It’s incredibly satisfying, and I think you’ll find it’s a great source of new inspiration in design and all areas of your life! Buying a new sofa? How do you know if the high-end option is worth it?